Overall length 6", Shank Length ⅛", Handle ¼" x 5½", 60° tip finish. Overall Length 6½", Shank 1/16" Dia. x ¼" Long, Handle ⅛" x 6" Long, 75° tip finish. 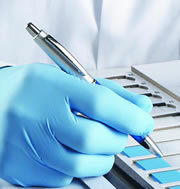 This is a high quality chrome pen that features appearance as well as utility. The diamond is mounted in a stainless steel tip and refills are available. The tip is finished at a 60° angle. Made from natural diamonds. These scribers are suitable for most precision applications, including working under the microscope as well as on small circuit boards. Overall length is 120mm (4¾") with a 60 degree angle tip. 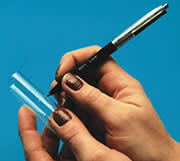 The Glascribe® Pen, with retractable tungsten carbide tip, lets you inscribe on glass, ceramics, and plastic. The pen has a pocket clip, so it is always handy when needed. 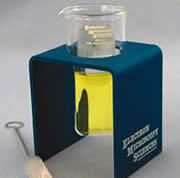 Permanently mark glass slides and all glass labware. These unique EMS pens have a sharp tungsten carbide tip which is able to etch glass, ceramic, and even plastic. The tip retracts for safe storage and it measures 9.8 mm in diameter. The pen is 137 mm long. An amazing tool that may be used to mark samples, engrave tools, indicate a sample area for finding in the SEM, deburring, and so much more. Easy to handle and control, this micro engraver is ideal for detailed engraving on almost any surface – wood, metal, ceramic, glass and more! 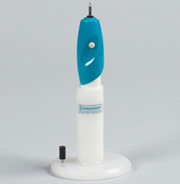 The micro engraver features a contoured grip for comfort and control and a precision-ground stainless steel bit with a diamond point tip. This diamond-tipped ballpoint micro engraver is also as small as a pen, so it easily fits in your pocket or purse for easy transport. Measures: 6¼" Product Weight 1.86 lbs. Slide coating cup with stand and cleaning brush. 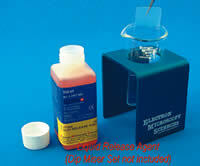 Glass cup is Pyrex and is designed to conserve expensive autoradiographic emulsion when coating glass slides. Needs only ¼ the volume of solution previously required. Single piece holder permits immersion in a water bath and provides a stable darkroom stand to prevent spills, and faster temperature adjustment of the emulsion. Prepared from 3-aminopropyltriethoxysilane in acetone. Good for coating glass slides to adhere paraffin sections for further processing without sections falling off from the slide. READY TO USE. A hydrosoluble mold-release agent for use in the flat embedding of micro-organisms, and as a replacement for the coating of glass slides to produce a smoother, even surface. The reference below describes the selection and precisely oriented sectioning of single cells by light microscopy, prior to examination by EM. Reymond, O.L. & Picket-Heaps, J.D., (1983) J. Microscopy, 130, 179. A TFE release agent, dry, lubricant. No discernible transfer, no migration, no build-up. Contains: Isopropanol, Poly-TFE, 1,1-Dichlorofluoroethane and Carbon Dioxide. Contains no silicones, CFC's or Methyl Chloroform. Its working temperature is up to 140°F. An all glass unit for the simple production of microdroplets. An object is held vertically in front of the nebulizer outlet and by squeezing the atomizer a fine spray is created. The nebulizer set comes with an All Glass Nebulizer bulb and Atomizer. XENIT contains more than five high-performance ingredients such as Citrus 66, an all natural, highly refined extract of citrus fruit. XENIT is specially formulated to break down the complex molecules found in sticky materials. With this unique character, XENIT may be used to quickly remove labels, decals, and adhesive from glass, wood, vinyl and metals. XENIT removes chewing gum from carpet and upholstery. It cleans permanent marker, crayon, and lipstick from walls, woodwork, and counter tops. XENIT also remove shoe scuffs and heel marks from vinyl and wood flooring, and grease and dirt from carpet, fabrics and upholstery. It even removes dried latex paint. XENIT Degreaser is a powerful, non-flammable solvent cleaner that quickly removes grease, oil, carbon deposits, gums, varnish, and dirt from metal surfaces. It is fast drying and evaporates completely and leaves no residue. This is the fast, easy way to remove dirt, grime, and food stains, pen ink, soda pop, soap scum. Cleaned surface dry quickly and leave no marks. 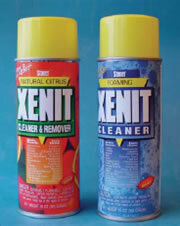 XENIT all natural citrus cleaner is the fast, easy way to remove sticky stuff, stains and gunk. XENIT removes greasy, grimy soils that soap and water can't. Cleans most surfaces in seconds. It cleans crayons, dry latex paint, gum, heel mark, ink, permanent markers, lipstick, shoe polish, sticker, tape, tar and sap. Specially formulated, Invisible Glass quickly and easily removes dust, dirt, oil, grease, fingerprints, smoke film, haze and more from glass surfaces, such as windows, mirrors, computer screens, display cabinets, and photocopiers. Invisible Glass contains no water and soaps, surfactants or foams so it will leave no residue that will either streak or haze. It stops static build-up on optics, disc drives, photographic materials, lenses, metal rollers ... any where that static may generate.